The Quaker Growth & Income Fund is a balanced, diversified, co-mingled fund managed for Quaker meetings, churches, schools and organizations with a long-term investment time horizon. 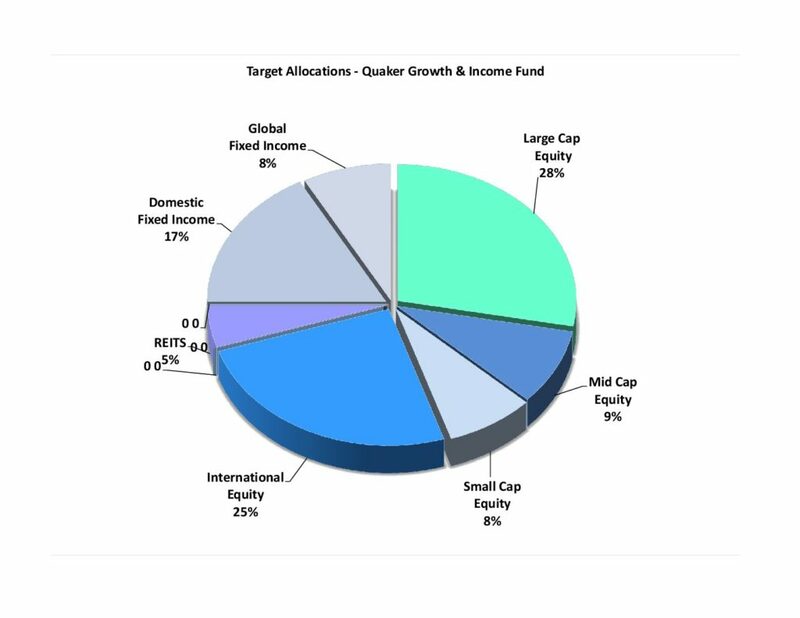 The Fund’s target asset allocation is 70% Equity, 25% Fixed Income and 5% REITS. Its primary objectives are stable current income and long-term growth consistent with protecting principal investments against inflation over time. The Quaker Growth & Income Fund operates with a semi-annual standard distribution rate of 4.0% for 2017, paid in June and December. The standard distribution rate is reviewed annually by the FFC Board of Directors and reflects our outlook on long-term capital market returns and inflation, and it takes into consideration the fund’s unique asset mix and expected volatility. The rate is set at a level that is intended to balances current distributions with preservation of principal over time. The standard distribution rate is intended only as a guideline for constituents who have invested their funds with FFC and constituents may, and some do, take more or less than the announced standard distribution rate. Quaker Growth & Income Fund unit value is net of operating expenses and a daily income accrual factor for the Fund’s semi-annual distributions. 1 Quaker Growth & Income Fund Benchmark: 28% S&P 500, 9% Russell Mid-Cap, 8% Russell 2000, 25% MSCI ACWI ex-US, 5% FTSE NAREIT and 25% Barclays Aggregate as of 2/1/14; formerly 42% S&P 500, 5% Russell 2000, 15% MSCI ACWI ex-US (All Cap World Index ex-U.S.), 33% Barclays Aggregate Bond, 5% FTSE NAREIT. Fees: The Quaker Growth & Income Fund estimated expense ratio for 2018 is based on budgeted investment fees and administrative expenses totaling 0.75% (75 basis points). The Fund’s total expense ratio for the past five years has averaged 0.76% (76 basis points). The Quaker Growth & Income Fund invests in stocks and bonds through SEC registered, third-party advisory firms and, as such, is subject to various risks related to the capital markets and to firm specific risks associated with advisors to the fund. Portfolio construction, asset allocation and portfolio management practices may not deliver desired results. The market prices of domestic and international equity investments may fluctuate and may decline along with moves in the broader equity markets or due to economic, industry or company specific events. International and emerging market investments are also subject to geopolitical risks, country specific economic events and adverse changes in currency values. The fund’s fixed income investments (i.e. notes and bonds) are subject to interest rate, credit, and liquidity risks. As interest rates rise, the value of fixed income investments will decline and may turn negative. Investment managers who work in an advisory capacity may not deliver investment results as anticipated. Investors in the fund could experience a decrease in the principal value of their investment or go through a period of underperformance relative to the benchmark.